President Cheryl Brickey called the Sept 12, 2015 meeting to order shortly after 1 pm and welcomed everyone. 20 members and 4 guests were in attendance with 6 new members joining today. Rainbow of Quilts, the UpCountry Quilters Guild's quilt show will be held at the Pickens View Wesleyan Church in Pickens, SC on October 2-3. Asheville Quilt Guild's quilt show will be held at the WNC Ag Center Davis Event Center in Asheville, SC on October 2-4. Aunt Het Quilt Show, the Nibble Thimble Quilt Guild's show, will be held at the Fountain Inn Activity Center in Fountain Inn, SC on Oct 3-4. Registration has begun for QuiltCon West which will be held February 18-21, 2016 in Pasadena, CA. QuiltCon East will be held in February 2017 in Savannah, GA.
QuiltCon West Challenge entry deadline is Nov 30th - There are two challenges, the Michael Miller Glitz Fabric Challenge and the EZQuilting Challenge using the mini triangle templates. Even if you were not able to sign up and receive the fabric or the templates, every MQG member is welcome to enter. Entry is open until Nov 30th for the juried and judged QuiltCon quilt show. The Silk Batik Scarf Workshop is coming up October 17th with Faye Jones. See the blog post dated August 31st for details and how to register. If you have registered and not paid, please send your payment to Faye ASAP as she will ordering the supplies on October 5th. Many thanks to Darlene for leading the the wonderful paper pieced workshop in August. Thank you to Brenda Wall for donating some QuiltCon goodies for giveaways this month. Congratulations to Nancy deJong who had a quilt juried into the Houston International Quilt Festival. October 10th @ Bernina 1-3pm: Favorite Notions - Bring one or two of your favorite sewing/quilting related tools or accessories to show and tell us why you love them. Remember, the items can be non-quilting related, maybe something found at a home improvement or office supply store. December - Year end luncheon, date and place TBD - We need a volunteer(s) to help plan, please email Cheryl at cheryljbrickey (at) gmail (dot) com. September's instructions for Square in a Square were passed out. Instructions are also available on the Meadow Mist Designs blog and there is an active Facebook group for the quilt-a-long. A lap-size quilt will be auctioned at a silent auction at a December 2nd fundraiser for the Meyer Center. No block of the month pattern was given out at the September meeting. We will discuss plans for 2016 blocks of the month at the November meeting. Dues were collected from 6 new members bringing the total paid membership to 33. 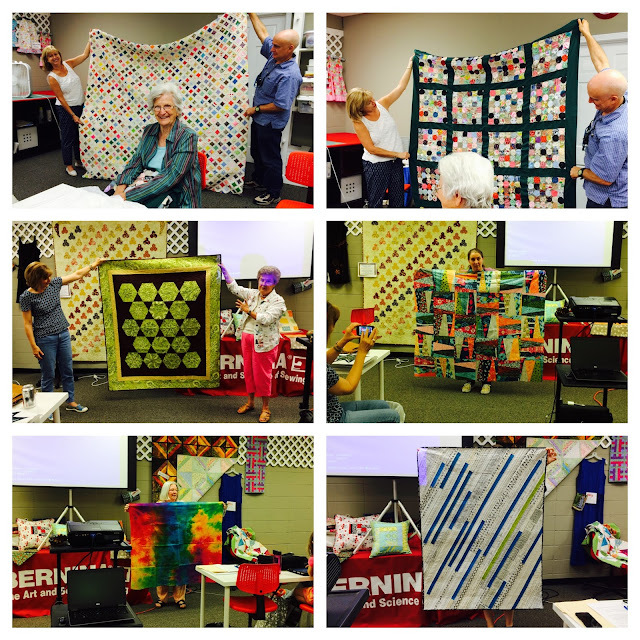 We are an official chapter of the Modern Quilt Guild now! Please take a few minutes to log onto the MQG website and fill out your profile. Please contact Cheryl or Paige if you have any troubles. Paige handed out copies of the membership roster. Nominating committee for the 2016 officers will be appointed in October. 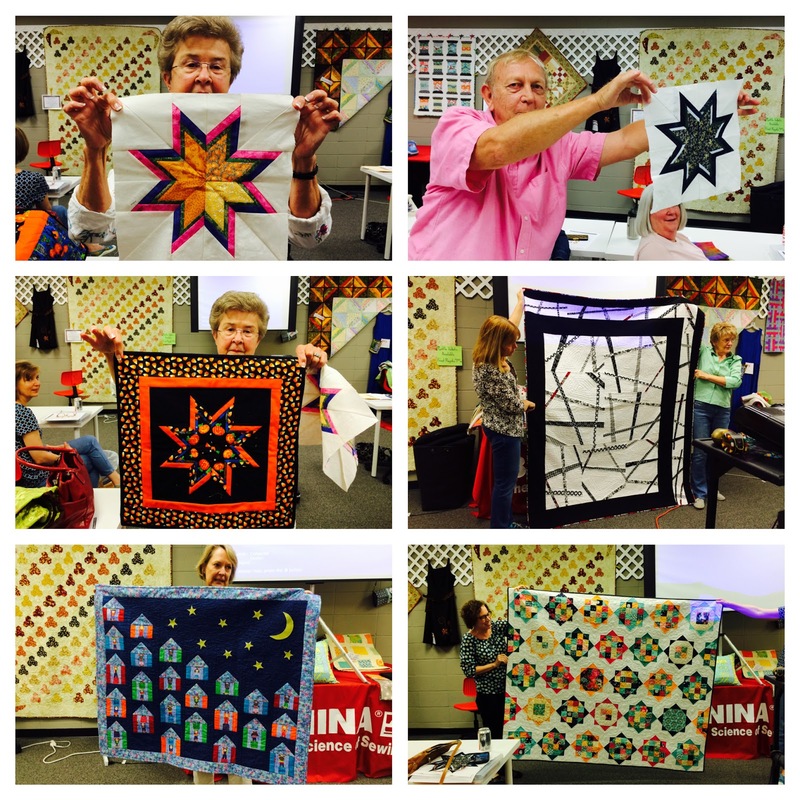 We had a wide variety of show and shares including blocks from last month's paper piecing workshop, hand dyed fabric, works in progress and quilts. Everyone brought in fat quarters, scraps and yardage of fabric from their stashes they no longer fancied and we spread it all out for us to swap about. Our swap also included books, magazines and patterns. There was plenty to go around for everyone. President, Cheryl Brickey, gave an informative presentation on digital quilt design. She walked us through the steps of designing the traditional churn dash block using Electric Quilt 7, CorelDRAW and MS Office PowerPoint showing us the strengths and weaknesses of each program. For those asking a questions, they were able to pick out a goodie from the QuiltCon swag that Brenda generously donated. With no further business, the meeting was adjourned around 3pm.